Proudly owned & exhibited by others. Introducing Leo Sired by Grand Ch Tyronelea Moonglow, Dam Grand Ch & Neut Ch Barcoo Taleoftwocities. Leo is owned, loved & trained by Dot Drescik. 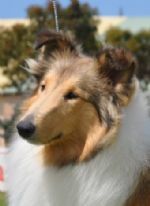 Leo is pictured after winning 1st place at Sydney Royal Easter Show 2017 in Novice Agility 600 mm class. Congratulations to Leo & Dot.